This is a dress I’ve had on my brain for a long time now. 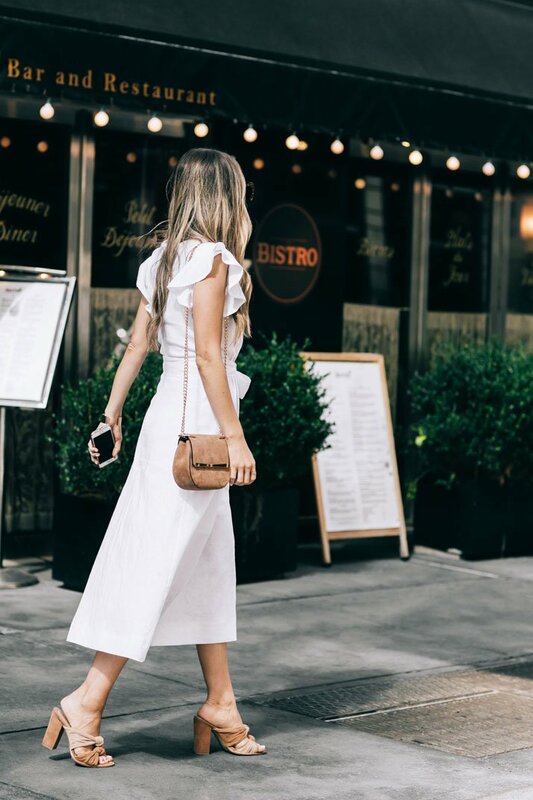 Linen is so timeless, and a ruffle sleeve midi dress just screams summer. 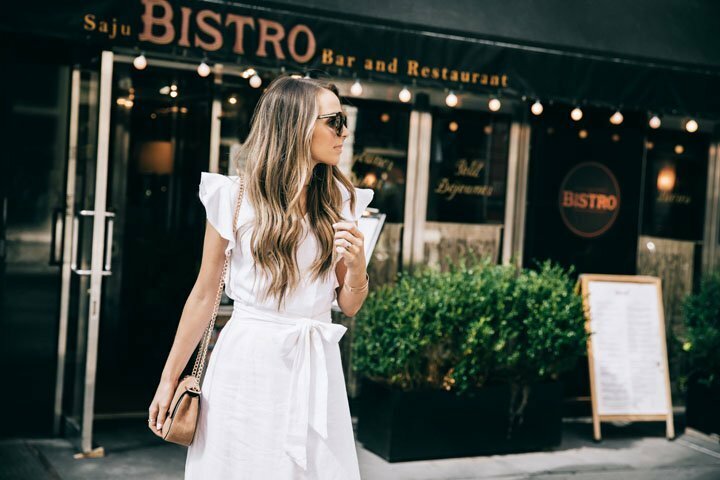 I’ve been trying to find the perfect linen blend to make it, and after ordering a few, I found this one from fabric.com and whipped it up for New York Fashion Week. It’s a linen/rayon blend, so it has a really nice drape, a super soft texture, it’s not super sheer (I still wore a slip underneath, but I didn’t have to), and it doesn’t wrinkle as easily as pure linen. Plus it’s under $9/yard! Of course I’m sharing this on the first day of fall, but this linen comes in a ton of other colors that would be really appropriate for fall. I love this olive green and this chambray color! Today I’m going to show you how to make this dress. It’s definitely an intermediate level project, so if you need to brush up on your sewing skills, check out my online video sewing guide! First, cut your pattern pieces. If you don’t know how to create your own pattern pieces, watch this video. You’ll need 2 BODICE FRONT pieces, and two BODICE BACK pieces, 4 NECKLINE LINING pieces, and 2 SKIRT pieces. You’ll also need RUFFLES for the sleeves (they should be about 4″ wide across), 2 CAP SLEEVE pieces (optional, only if you want a little sleeve underneath), and a WAIST TIE piece (5″ wide by about 6′ long). Step 1. Take your NECKLINE LINING FRONT pieces and sew them together with right sides of the fabric together. Step 2. Take your BODICE FRONT pieces and add darts in the side if necessary. (I’m pretty flat chested, so I didn’t need darts. But add them in if you need them). Then, with right sides of the fabric together, sew the front together. Step 3. Take your NECKLINE LINING and BODICE pieces and sew them together in the front with a straight stitch, then flip the neckline inside and press in place. You can topstitch here if needed. Step 4. With right sides of the fabric together, take your NECKLINE LINING BACK and two BACK BODICE pieces and sew them together at the neckline. Step 5. Now take your BACK and FRONT BODICE pieces and sew them together at the shoulders. (optional) Create gathers in the front of your dress on either side and topstitch in place. Step 7. Hem your CAP SLEEVE piece, and then layer it over your RUFFLE SLEEVE piece and stitch in place along the arm hole of the bodice, as shown. Repeat for the second sleeve. Step 8. Sew up the sides of your bodice with right sides together. Step 9. Take your skirt pieces and cut one of them down the middle to make two equal halves. Now sew the back and front pieces together on the sides as shown. Step 10. 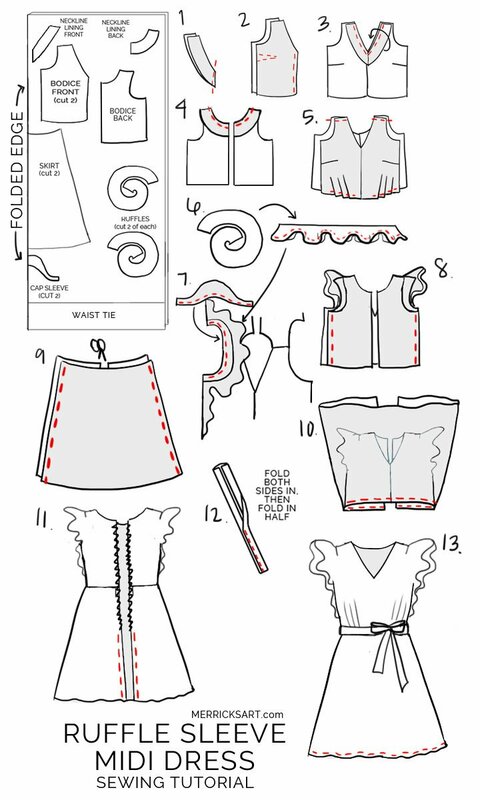 Take your bodice and skirt pieces and attach them at the waist with right sides together. Step 11. Insert the zipper in the back of your dress using the instructions on the zipper. Then sew up the rest of the back of the dress. Step 12. Create your tie by folding both sides of the fabric in and then folding in half again and stitching it closed. Alternatively, you can sew it up with right sides together and then turn it right side out. Step 13. Hem the skirt to your desired length and you’re done! Linnen and ruffled white dress – perfection in my books! Beautiful DIY post! I bet everyone was asking you who were you wearing. Such a gorgeous piece! 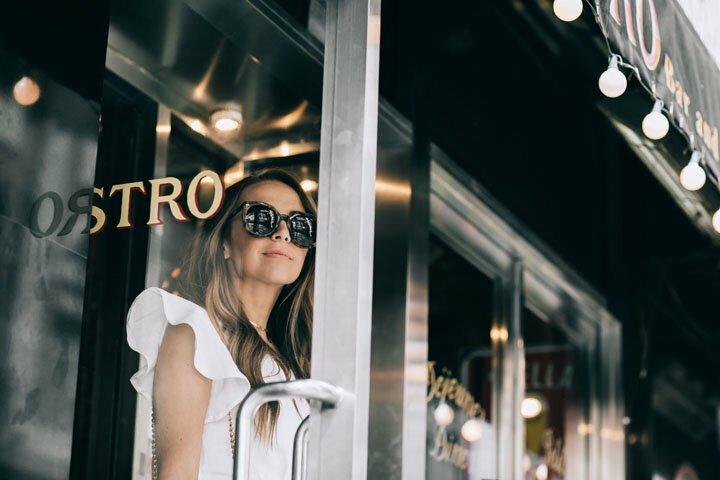 This is absolutely stunning and such a perfect white piece for summer! Great tutorial! Thank you very much for your recommendations, you are a miracle! I also very much love linen clothes for its lightness and practicality. I recently discovered a great store – https://magiclinen.com/ which has lots of linen clothes and home accessories! It was a real discovery for me! Hi i love This dress. This Is going to be the second item I am making from your blog! I do have a Question about Making the pattern for the ruffles. How did you draw tHem out/what Were the proPortions? I am so excited to start this project!